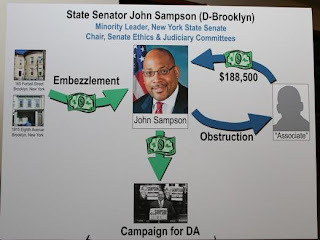 State Sen. John Sampson, of Brooklyn, was arrested by the FBI this morning and charged with embezzling $440,000 between 1998 and 2008, funneling some of the cash into his unsuccessful 2005 campaign to become Brooklyn district attorney — and chillingly using a mole in the federal prosecutor's office to try and identify witnesses against him so he could arrange to "take them out." At a press conference announcing the veteran politician's arrest, Eastern District US Attorney Loretta Lynch revealed the disturbing allegations that Sampson had a Justice Department mole in her office to keep tabs on the criminal probe into his activities — and leak information about the identify of federal informants. John Sampson leaves court today. "He did attempt to trade on a personal relationship with an administrative employee [of the Justice Department]...to gain information," Lynch said this morning. The feds charge that Sampson explained to an unnamed real estate associate that he was attempting to discover the identities of federal witnesses in the Brooklyn US Attorney's mortgage fraud probe into his activities. In one ominous exchange, Sampson allegedly told the real estate associate that if they could learn the identity of the federal informants, that "Sampson could arrange to 'take them out,'" the feds said today. That Brooklyn federal employee has since been terminated, but Lynch declined to offer details about an internal probe that followed — saying aspects of the investigation into Sampson's alleged wrongdoing is ongoing. The criminal charges against Sampson — who sat on the state Senate's Ethics and Judiciary committees — undermines the public trust in their elected representatives and "causes people to become more cynical," Lynch said at the press conference. Lynch said the underlying ethos behind Sampson's alleged illegal conduct was the Democratic legislator's selfishness. "The fact that he was trying to become the top state prosecutor in this borough shows the extreme arrogance and hubris" that appears to pervade Sampson's character. "It's all about him," the prosecutor said. Lynch said the embezzlement scheme stems from Sampson's work as an attorney who also served as court-appointed referee over foreclosure proceedings in the Brooklyn Supreme Court. Sampson is charged with embezzling some $440,000 from the foreclosure sale of four properties in Brooklyn. 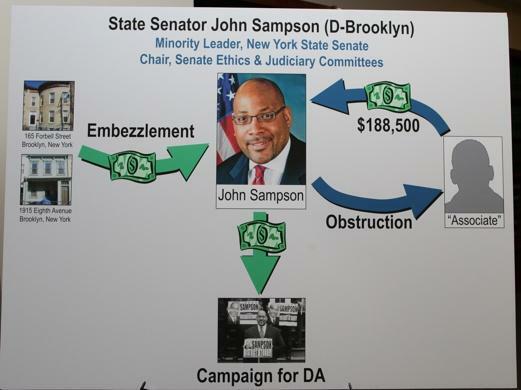 It was those embezzled funds that Sampson allegedly used in part to help underwrite his campaign to become Brooklyn's top law enforcement officer, when he ran for DA in 2005, Lynch said. Lynch said Sampson also allegedly stole $188,500 from a real estate associate after promising to pay the loan money back, the feds say. After the feds began probing this alleged incident, Sampson allegedly tried to discourage the real estate associate from cooperating with investigators and encourage the person to lie, said George Venizelos, who heads the FBI's New York office.